In November 1989, on the initiative of Svetoslav Roerich and based on the resolution of the Council of Ministers of the USSR № 950 dated 04.11.1989, in Moscow was founded the public Museum by name of N.K. Roerich as the main base of the Soviet Roerichs Foundation. 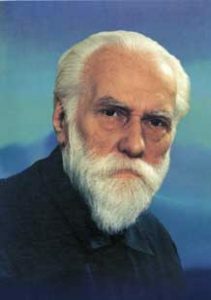 After the collapse of the Soviet Union, the Fund was converted by Svetoslav Roerich’s initiative into the International Center of the Roerichs, whose Honorary President he remained until the end of his life. By Moscow Government Decree No. 2248 of 28.11.1989 the International Centre of the Roerichs (ICR) received the historical Lopukhin Manor in Central Moscow, which Svetoslav Roerich chose himself from several buildings proposed to him for creating and placing in it a public museum. To create the Museum, Svetoslav Roerich planned to donate from India the priceless heritage of his parents: hundreds of paintings, a library, a unique archive, valuable rarities. He put the country on mandatory terms for the transfer of the heritage: the Museum must be public, must be administered by the public organization founded by Svetoslav Roerich himself, and must be located in the Moscow Lopukhin Manor. These terms and conditions had been laid down in the Decree of the USSR Council of Ministers No. 950 dated 04.11.1989. The Government promised to a large extent assist in creating the public Museum, and in 1990 Svetoslav Roerich sent the heritage to the public organization in its homeland. Unfortunately, subsequently, ICR was denied the promised governmental aid. Based on the parent’s heritage handed over by Svetoslav Roerich, the International Center of the Roerichs, under the guidance of Lyudmila Shaposhnikova, prominent Russian cultural figure, scientist and thinker, together with broad support from the public, created the public Museum by name of N.K. Roerich. The International Center of the Roerichs is a member of the Pan-European Federation for cultural heritage “Europa Nostra”, a collective member of the International Council of Museums (ICOM), an associate member of the International Organization of National Trusts. ICR is an associate member of the Department of public information of the United Nations and participates actively in its annual conferences. ICR has special consultative status with the Economic and Social Council (ECOSOC). The International Center of the Roerichs, which is based on the public Museum, is the only public Museum Center in the world which regularly executes touring exhibitions of original paintings of the Roerichs in Russia and foreign countries. Such exhibitions help to the dialogue of cultures. Since the early 1990 ‘s to 2015 ICR and its Museum by name of N.K. Roerich more than 500 exhibitions of paintings of the Roerichs had been organized in 250 cities. ICR holds great research work on studying the archive of the Roerich family passed over by Svetoslav Roerich. It employs researchers of creativity and life of the Roerichs from all over the world. ICR has collected a unique scientific library in various areas of culture and science, which is the indispensable scientific and educational resource for the study and popularisation of the literary and journalistic heritage, as well as the philosophical and scientific works of the Roerich family. Since 1992, ICR holds within the walls of the Museum by name of N.K. Roerich annual international socio-scientific conferences, devoted to the study of the Roerichs ‘ heritage, preservation of world cultural heritage and peacemaking ideas of the Roerich Pact. These conferences are organised in collaboration with authoritative scientific and cultural institutions, well-known scientists, public and Government officials and cultural celebrities. They are attended by hundreds of scientists and public figures from Russia, Europe, Asia and America. A number of international conferences had been devoted to the problems of preserving Culture and the Roerich Pact. As part of its educational activities, ICR publishes the works of the Roerichs, as well as books on the life and work of the Roerich family, the contribution of this family in the world treasury of culture, publications on the Roerich Pact and the Roerich heritage for the development of human culture and civilization. It have been released about 200 titles that received high distinctions at the Association of book publishers of Russia. On occasion of the international professional exhibition “Press 2008”, the artistic and scientific and public journal “Kultura i vremya”, issued by the International Center of the Roerichs, was awarded the Sign of Excellence “Golden Fund Press 2008”. The magazine is telling about the essential role of culture in human spiritual development and harmonious development of all spheres of social life. Over the 26 years of its existence, the International Center of the Roerichs has become not only the largest, but also the world’s leading organization for the preservation, study and popularization of the Roerichs ‘ heritage, based on the humanistic ideas of the priority of Culture in the life of mankind.